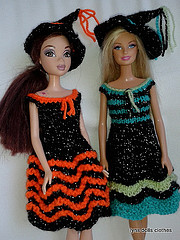 A witches dress and hat for Barbie in two different colourways. The skirt is made using the feather and fan pattern which gives a nice ruffled effect and the bodice is either plain or striped. The dress is made in one piece with a centre back seam. 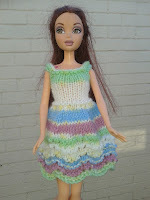 I tried this pattern using a multi-colour yarn which makes a lovely little dress. Add tassels to hat and centre front of dress.